I have boosted 08 s2000. On the original tune we had the frequency set at 50hz and with the boost duty cycle set at 22% it would hit 11.6psi. 23% would see psi above 19psi of which our boost cut was set at. Cant target anything between 11.6psi and 19psi. Out of curiosity i played around with the frequency on my own time and noticed i could target boost in 2psi increments with the frequency set at 16hz. With each boost duty cycle increase of 1% at 16hz frequency, psi would increase by 2. Side note, inputting a value of anything 15hz or lower, the number would increase to 887.16 hz or some other crazy high number when i click the mouse outside the box. I found 16hz or higher would remain. But even with the frequency set at 16hz, the boost duty cycle percentages are still really low in the 20s% to target psi in the low to mid teens. For example, 16hz, 24% duty cycle, would equal 10psi. And 25% would equal 12psi. Isnt it ideal for the duty cyle to be in the 50s%? I can now target desired psi, but only problem now is that i can hear the turbo fluttering as it builds up boost and the response of the turbo is slowed by 500-1000rpm for it to hit full boost at 16hz. And oddly, with the frequency set at 20hz, it is just as sensitive as when it was originally set at 50hz. Why is it doing this? My tuner says the 4port is too sensitive and to change it out for a 3port. Is there any way to get the 4 port to work properly? Or is the 4 port more ideal for higher psi figures? It appears that there may be a bug in the software that needs to be corrected. I have forwarded this on to the software engineer. So is there an ideal (frequency/duty cycle % range) setting for the 4port on a turbo s2000? Anything under 20hz frequency seems to worsen performance. 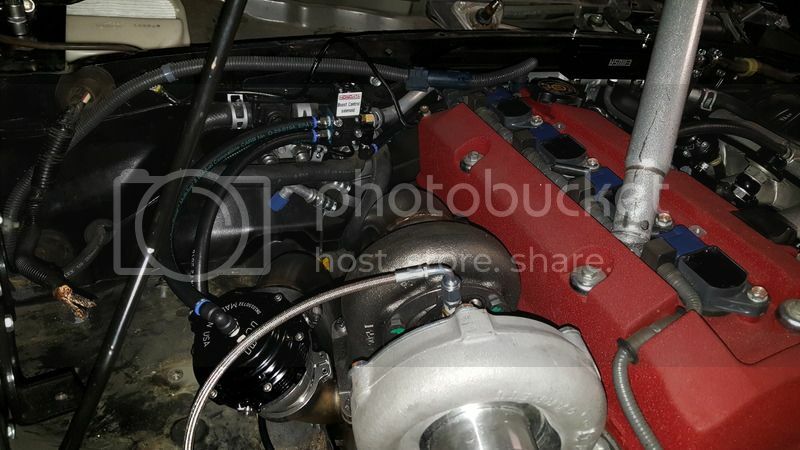 For example, when i target 12psi at 16hz and floor it, boost would hold at 10psi up until about 5k rpm then creep to 12psi and hold all the way to redline. And the turbo would flutter while building up boost. When i target 12psi at 50hz, it would hit full boost of 12psi right at 4k rpm. But i cant target anything above 12psi as described in the first post. I would recommend that you stop trying to tune this with boost control until we have released software which corrects the problem you have reported. That may be a few weeks. We've fixed the minimum frequency bug (the minimum is 15.25 Hz), but it is not going to change your underlying problem. Check the spring on the wastegate is what you thing it is (what is the spring pressure?). Also double check the way the solenoid is plumbed in. Lastly check that you exhaust manifold has the wastegate in the center with feed from all four exhaust runners. Spring pressure is only 4 or 5lbs. Heres a pic of the plumbing. On the left of the solenoid, top of wg goes to top of solenoid, bottom of wg to bottom of solenoid. On the right of the solenoid, top of solenoid is vented to atmosphere and bottom is to my vacuum block. Manifold wg flange is correct. Hey just wanted to update this thread. My tuner and i could not get the hondata 4port solenoid to function properly. It was impossible to target anything between 13psi and my cutoff of 19psi as a 1% increase in boost DC would shoot it from 13psi to my boost cutoff. My tuner suggested using a mac 3 port solenoid and said he had several occasions where the 4port is just too sensitive. We were able to successfully dial in the 3port with the exact same setup including same wg spring using a range of 24-38% DC at 50hz equating to 10-18psi (much more tuneable range of values).